The Paris Agreement on climate change announced on December 12 has been hailed as a triumph of diplomacy and international cooperation. It was all that - and it was also proof of the power of data. Decades of data on global temperature change, melting glaciers, and rising carbon dioxide levels have become too compelling to ignore. Data is most powerful when it is available as open data - public data, from government and other sources, that is available for anyone to use, reuse, and republish in any way. During the Paris conference that led to the Agreement, the nonprofit Center for Open Data Enterprise, which I lead in Washington, DC, partnered with the Government of Mexico, the French Government's Etalab, and the Open Data Charter to host a roundtable on open data and climate change. The roundtable convened more than two dozen participants from governments, international development agencies, academia, NGOs, and the private sector who are applying climate data in new ways that can lead to new solutions. Here are some of their priorities. As the international community works to fight climate change, we will need more and more data to monitor how the planet is changing and how global programs are making a difference. A combination of satellite data, big data analytics, and cutting-edge data visualization is providing this kind of data in unprecedented detail. At our roundtable, Randy Sargent, who has a joint appointment with Carnegie Mellon University and Google, presented his team's work with Google Earth Engine Timelapse. Using three decades of data from Landsat, the U.S. Geological Survey satellite program, Timelapse provides stunning and sobering visualizations of urban growth, deforestation, retreating glaciers, and other changes related to climate change. Sargent hopes that this tool will be a powerful motivator to address the forces that are visibly reshaping our planet. While Landsat scans the entire earth once every two weeks, new satellites will be able to observe changes on the earth's surface much more quickly. The European Space Agency's Sentinel 2 program, which will have two satellites in orbit by mid-2016, will be able to update earth observation data every five days. At the same time, the private company Planet Labs is deploying a flock of small satellites that will update earth imagery every 24 hours. This rapid, comprehensive data collection can make it possible to spot illegal activities like deforestation in time to stop them quickly. The Paris Agreement requires countries to release open data on their progress toward climate goals. Under the Agreement, countries must report on their greenhouse gas emissions at least every two years, using a common reporting framework, and must submit their data for review by independent experts. Like other transparency initiatives, the Paris Agreement is designed to make data available publicly in a way that allows any organization to examine the data, analyze it, and advocate for change where necessary. It's already too late to prevent many of the effects of climate change, and governments around the world are developing strategies to cope with the impact to come. A recent report from Data-Pop Alliance, a global coalition on big data and development, shows how data analysis can help cities, countries, and communities become more resilient to these inevitable challenges. For example, satellite images can show places where infrastructure needs to be strengthened to withstand future storms and rising seas. Predictive data analysis can help determine where flooding is most likely to happen, where sea walls will do the most good, and how to prepare for the impact of changing weather patterns. To help deal with the climate's impact on agriculture, the GODAN program, which stands for Global Open Data on Agriculture and Nutrition, is coordinating data worldwide on soil quality, water availability, and other relevant factors. The Paris Agreement requires all countries to become carbon-neutral by the end of the century, a goal that will require a massive shift to renewable energy. In the U.S., the Energy Information Administration is releasing new data and tools that will help make better energy planning possible. The drive to renewables won't come from governments alone. A growing number of new companies, from SolarCensus in the U.S. to REConnect in India, are analyzing geospatial data to figure out where to situate wind, solar, and other renewable power generators for maximum efficiency. The Solutions Project - co-founded by Stanford professor Dr. Mark Jacobson, who spoke at our open data roundtable - has charted a path to fully renewable energy for more than 100 countries. Jacobson and his colleagues have analyzed data on energy usage, costs, and other factors to develop a country-by-country plan for shifting to carbon-neutral energy production by 2050, five decades ahead of the deadline set in the Paris talks. Climate activists are also promoting this vision of a low-carbon world. I spoke in Paris with Laura Cross, a member of SustainUS, a youth-led advocacy organization that sent almost 20 delegates to the Paris talks. "Organizations like the Solutions Project give people the information we need to advocate," she told me. "I can now point to data that show it's absolutely possible to get out of our dependence on fossil fuels." In a data-driven era, we're seeing a new, compelling equation. 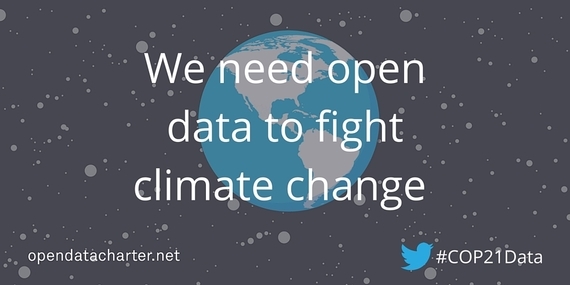 If we're lucky, climate science plus data science will equal action, progress, and hope.